It offers a huge variety of lenses and shooting modes, hand-picked filters and the best beauty effects, run through our own face detection technology. All of this plus more than 800 decoration options and the most amazing collage effects. - Out of Focus, Anti-Shake, Timer, Self-Portrait, Touch Shots and other shooting modes to help you get the best out of your capturing experience. - More than 20 carefully selected filters to bring different emotions to your photos. Adjust the light and intensity of the filters individually. Add one of our 20+ borders and light filters to give your photos a completely different feel. - Big Eyes, Smile, Slim Face, Clear Spots, Liquify, Brighten and more options to help you make the most beautiful portraits. - No more zooming in and out and doing things manually! Our face detection technology allows Cymera to locate every trait of your face and know exactly where to add the effect. – We have compiled over 70 different realistic hair and makeup items to help you complement your looks. Truly the best beautifying effects in the market! - One picture is not enough. Make photo stories with our multiple collage options. - Cymera offers diverse fixed and freestyle collage layouts plus really beautiful backgrounds and editing functions that will help you have the best collage experience. - Over 800 decoration options that include: stickers, comic masks, frames and more. All free. - A beautiful variety or brushes with different colors, lines, patterns and shapes to help you express yourself and make unique photo decorations. - Cymera offers all the other complementary editing functions such as rotation, cropping, auto level, brightness, contrast, saturation, sharpening and more to enhance the quality and versatility or your photos. All in a simple and easy to use interface. Awarded the “Certificate of Merit” at the 2012 Asia Smartphone Apps Contest for the Creative Lifestyle category. A) Depending on the device, the front camera could get inverted. If you want to fix this go to Settings>turn ON the Self-shot image flip-H option and that will do. Q) I want to download more stickers, comic masks and frames. Are they available for free? Q) I’d like to manually write things on my photos. how do i do this? A) Easy. Just go to Cymera>Decoration>Brush> select the color and style of your preference and have fun! Q) I’d like to be able to merge different photos together. 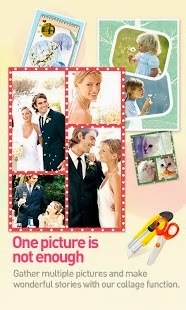 A) Use our multiple collage functions to make beautiful photo stories. Make it better with our different background and collage layout options. All free. 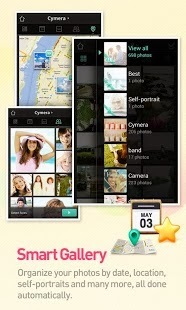 ■ Use our API whenever you need to use Cymera to take and edit photos fast and easy. If you would like to know what’s going on or what’s coming for Cymera please visit our Facebook page at http://www.facebook.com/CymeraApp. Tags: Photo, Pictures, Camera, Editing, Editor, Frames, Collage, Merge pictures, brush, filters, face detection, beauty, plastic surgery, makeup, retouch, stickers, decoration, deco.